We haven't heard much about The Maze Runner: The Scorch Trials since the new trailer debuted last month. With the upcoming sequel hitting theaters very shortly, 20th Century Fox has put out an animated video that breaks down the horrific Flare Virus. In last year's The Maze Runner, Thomas (Dylan O'Brien) and his group of survivors managed to escape the perilous maze, only to find a planet in ruins, now known as the Scorch. 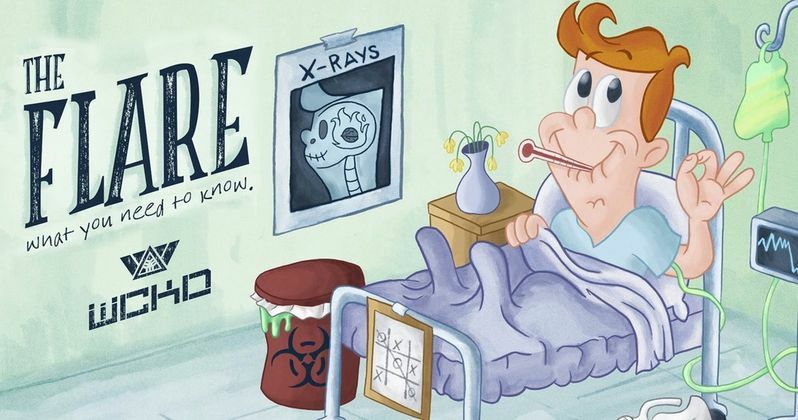 The video is crafted in the style of a gleeful educational video, even though the Flare Virus they describe is truly horrific, even when shown through animation. In this next chapter of the epic Maze Runner saga, Thomas (Dylan O'Brien) and his fellow Gladers face their greatest challenge yet: searching for clues about the mysterious and powerful organization known as WCKD. Their journey takes them to the Scorch, a desolate landscape filled with unimaginable obstacles. Teaming up with resistance fighters, the Gladers take on WCKD's vastly superior forces and uncover its shocking plans for them all. Phase Two has just begun. The Scorch. There are no rules. There is no help. You either make it or you die. The Gladers have two weeks to cross through the Scorch-the most burned-out section of the world. And WICKED has made sure to adjust the variables and stack the odds against them. Friendships will be tested. Loyalties will be broken. All bets are off. There are others now. Their survival depends on the Gladers' destruction-and they're determined to survive. The Maze Runner stars Thomas Brodie-Sangster (Newt), Kaya Scodelario (Teresa), Ki Hong Lee (Minho) and Patricia Clarkson (Ava Paige) reprise their roles from the hit adaptation, and are joined by a slew of new cast members. Aidan Gillen portrays the villainous Janson, alongside Giancarlo Esposito as Jorge, Lili Taylor as Mary Cooper, Nathalie Emmanuel as Harriet, Katherine McNamara as Sonya, Rosa Salazar as Brenda and Jacob Lofland as Aris Jones. The Maze Runner earned $340.8 million worldwide at the box office from just a $34 million budget. In addition to this unique video, we also have a new international poster, which features some of the Scorch's unforgiving landscape, along with stars Dylan O'Brien, Thomas Brodie-Sangster, Kaya Scodelario and Ki Hong Lee. Stay tuned for more from The Maze Runner: The Scorch Trials, as we get closer and closer to the September 18 release. Until then, check out this animated video and the new poster.